Airdaniar Cottage is located on the Applecross coast in Wester Ross at OS grid reference NG 694 552 on OS Landranger Map No 24 (Latitude 57.527813, Longitude -5.856607). The post code is IV54 8XL. Access is either by the Bealach na Ba (the pass of the cattle) or by the coast road from Shieldaig. The cottage is on the seaward side of the coast road and is reached by a short private road. At the end of this road there is adequate parking adjacent to the cottage for two cars. Although the Ordnance Survey map shows adjacent buildings, these are the remains of the old crofting township of Callakille. The nearest inhabited cottage is approximately half a mile away. 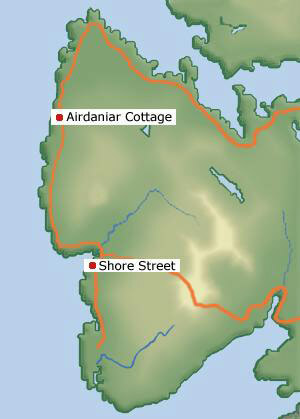 Airdaniar Cottage is eight miles from Shore Street where the Applecross Inn is located. The Potting Shed Restaurant and the Post Office and General Store are near to Shore Street. Shore Street is often referred to as Applecross Village. This, however, is not strictly correct as Applecross refers to the Peninsula and not any individual community or township. Although most visitors to Applecross travel from home by car, others prefer to travel by public transport to Inverness and hire a car locally. Flybe and EasyJet fly from a number of locations to Inverness. 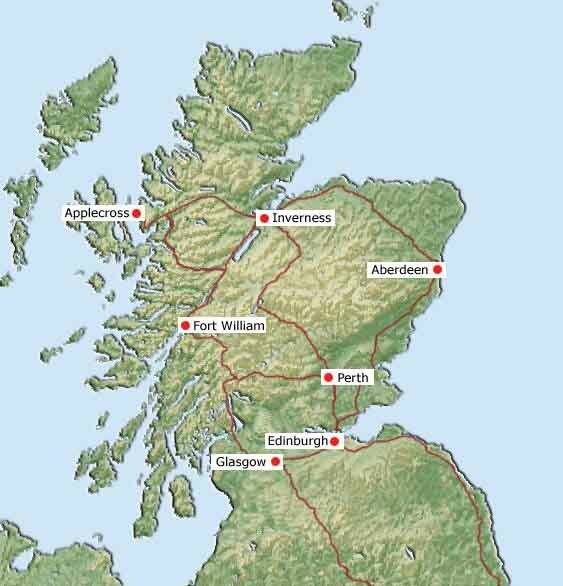 National Express coaches also has Inverness as a destination. The nearest mainline rail station is Inverness. Check our location and get directions with Google. Please note that Google refers to Callakille as Kalnakill. Guest comment - This house is a little oasis. We've had a wonderful time - beautiful cottage in a magnificent secluded location.